Its been a busy season for Anglicans and the emerging church. – Karen Ward re-launches the Anglimergent social network which is like Presbymergent but Anglican. I am number 87. – Becky Garrison publishes “Rising From The Ashes: Rethinking Church” and stakes a claim for Episcopal involvement in the American emerging church scene. – EmergingChurch.info is still the leading result for Google search on “emerging church” after many years at the top. (Wikipedia sometimes beats it). 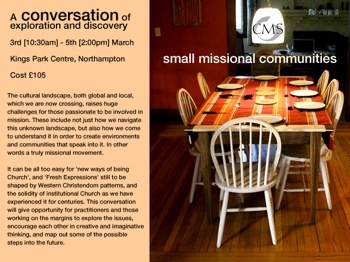 Also, A Church Mission Society sponsored meeting in March in Northampton will see about 30 key leaders come together around the idea of “Small Missional Communities”. And yes, I will be there for that. Who in the emerging church movement will be at Global Anglican Future Conferece [GAFCON] in Jerusalem? Who will be at Lambeth and might want to help run a Lambeth Fringe event to inform Bishops of new emerging church opportunities and information? Are there one or two leaders who are thinking way beyond the Fresh Expressions box that really need to be at Small Missional Communities? Read the flyer below and shoot me an email if you know of someone. There might be room for one or two more. and I’m one who has hope for some in the Anglican episcopacy tp emerge and lend some help to Anglimergents on the ground and down the rabbit holes. Assuming I can get the funds and a press pass, I’ll join you at Lambeth. I doubt that crowd going to do Jerusalem will do anything of an emerging nature based on how some of the participants behave in the states but keep me posted. but are really interested in this can be kept up to speed with the convo in some way? the project i’m involved in has over the last few months moved into a phase of developing smaller missional communities. tbh partly inspired by some of the stuff you flag up, and the obvious need to keep things small to remain missional. so would really value any feedback on this stuff. Hey Andrew – I found this blog post by doing an “emerging Anglican” google search. You might be interested to know that Trinity School for Ministry will be hosting a conference on emerging Anglicanism this summer.